March is the longest month of the year in New England, a generally dreary 31-day slog toward spring. Even though clocks move forward early in March (second Sunday of the month at 2 a.m.), Daylight Saving Time can't fool Mother Nature into waking up tulips and gracing New England with radiant warmth... yet! In March, a prolonged case of cabin fever can make you feel almost as miserable as the flu. But there are antidotes aplenty in New England. It’s the best month of the year for breakfast lovers, as sap flows in maple trees and the year’s new crop of maple syrup is produced. Maple events in New England celebrate the harvest and offer visitors an up-close look at the maple sugaring process. 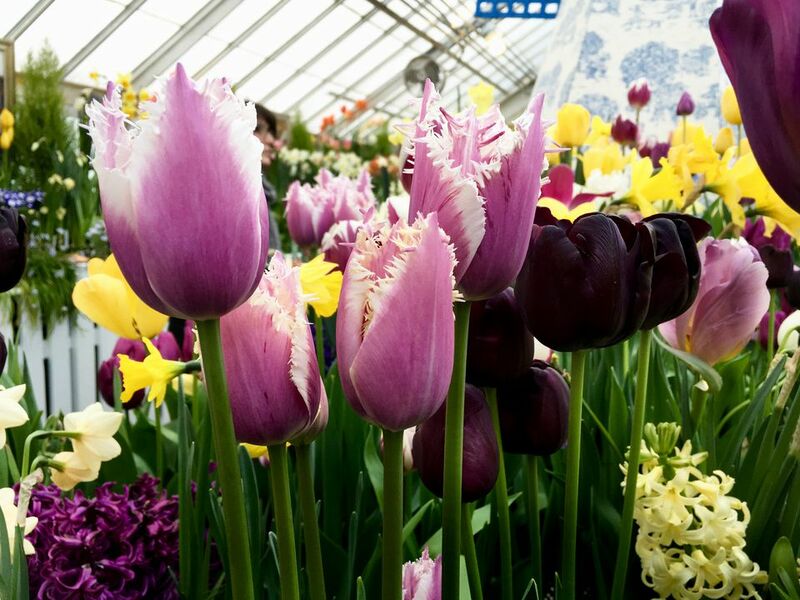 In Northampton, Massachusetts, tulips and daffodils defy the elements and provide a welcome breath of spring during the two-week Smith College Bulb Show each March. And St. Patrick's Day turns many New England cities and towns green long before the snow melts. It’s last call for winter sports in New England and prime time for eagle watch cruises on the Connecticut River. And for those who have simply had enough of shoveling and roof raking, there are heated outdoor pools to swim in even in March and many other ways to forget it’s winter in New England. With any luck, March in New England goes "out like a lamb," as the old saying suggests. But this unpredictable month can deliver a wild spectrum of weather... everything from blizzards and biting cold temperatures to summer-like 80-degree days. March's unpredictable weather makes this the month to overpack. The farther north you travel, the more likely you are to need full-on winterwear... even at the end of the month. It's going to be cold at night, even when daytime temperatures warm, so you won't regret those extra socks and sweatshirts. Keep in mind that "mud season" often begins by the late part of March, so you'll want to pack clothes and boots with sloppy terrain in mind if you'll be spending time outdoors. The Maine Science Festival will be held March 13-17, 2019 in Bangor, Maine. Featuring talks, workshops and activities for all ages at several city venues, the festival aims to make science fascinating and relevant to the general population and to showcase Maine ingenuity. There is even a Thursday night Science on Tap event exclusively for ages 21 and up. The entire festival is free with one exception: Tickets to Saturday night's headliner, Science Vs, are $17 for adults and $10 for students in advance with a $5 increase at the door. March events tempt New Englanders and visitors to come out of hibernation. There are no legal holidays in New England in March, but there are some less "official" holidays worth celebrating. March 2: Dr. Seuss's Birthday - Visit the Dr. Seuss National Memorial Sculpture Garden and Amazing World of Dr. Seuss Museum in Springfield, Massachusetts: birthplace of the beloved author. March 14: National Potato Chip Day - Pay homage to America’s favorite snack food by taking a free tour of the Cape Cod Potato Chip factory in Hyannis, Massachusetts. March 17: St. Patrick’s Day - Boston is America’s most Irish city and the best place in New England to celebrate St. Patrick’s Day (the parade in South Boston attracts as many as a million spectators! ), but it’s far from your only option. In Connecticut, big St. Patrick’s Day Parades are held in New Haven, Mystic and Hartford. Manchester, New Hampshire, and Newport, Rhode Island, also go green with parades and lively festivities. Ready to embrace the unpredictability of March in New England? Here are a few of your best bets for a March getaway. For the best late-season skiing, head north to resorts like Maine’s Sunday River or Sugarloaf or Stowe in Vermont. If you already splurged on Valentine’s Day and are counting your pennies with Tax Day looming, whisk your sweetheart away for an affordable overnight at one of these New England Bed & Breakfast Inns with Rooms Under $100. Make New England your March Madness destination. If the NCAA basketball tournaments always capture your attention, this is the perfect month to plan a visit to the Basketball Hall of Fame in Springfield, Massachusetts. March is a notorious month for sloppy weather. Whatever you do... don’t pack your best pair of shoes. If you’re a New England college student who can’t afford to escape to a warm-weather destination during your March Spring Break, make the most of your week off by hitting the ski slopes on the cheap.